It's time for the most fun gathering of (living) souls! (SPOT.ph) We're officially a week away from Halloween and we don't know about you, but we're so ready for the most bewitching night of the year! In case you're too busy to make plans, we've made it easier for you. 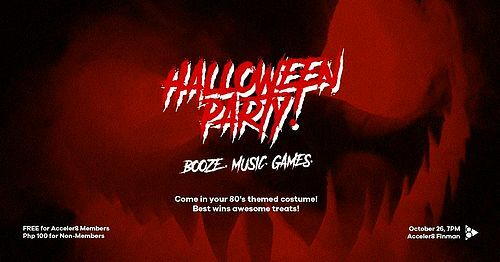 Just show up in your creepiest costume and pick one party (or two!) 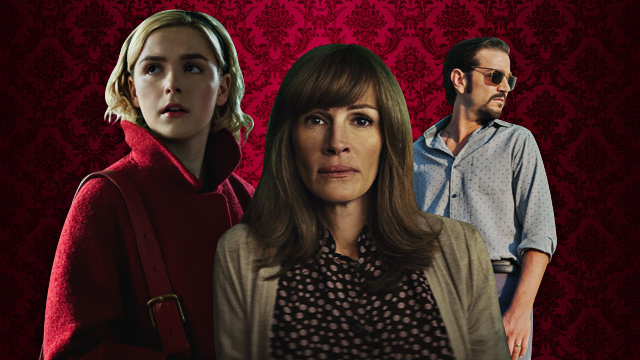 from our list below that you can hit with your gang of Halloween freaks! 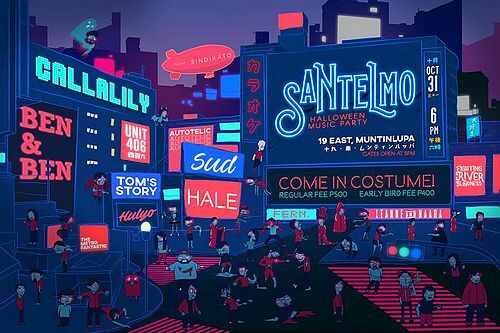 The biggest party heads down south as the Santelmo Halloween Music Party holds the most exciting night of them all on October 31, 6 p.m., at 19 East in Muntinlupa City. Spend the night singing along to the tunes of your favorite OPM bands: Hale, Sud, Callalily, Ben & Ben, Tom’s Story, and more! Tickets are priced at P500. Don’t forget to come in your most unique costume, too! For more information, log on to Santelmo’s Facebook page. 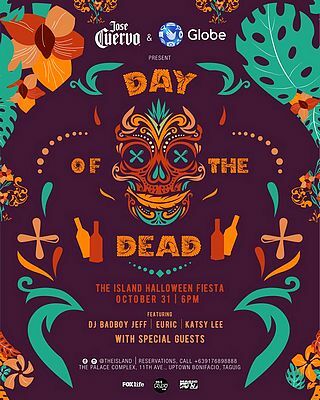 Turn the mood around and make Halloween the most fun fiesta yet at The Island’s Day of the Dead, happening on October 31, 6 p.m. Dance the night away to the beats of DJs Bad Boy Jeff, Euric, and Katsy Lee. Plus, James Reid, Nadine Lustre, Kingwaw, Curtismith, Astrokidd, and Sofia will be there for exciting performances. Come in your best “Day of the Dead” costume to enter the party (yup, no kidding!) and win prizes! For more information, log on to The Island’s Facebook page. Ready for the purge? 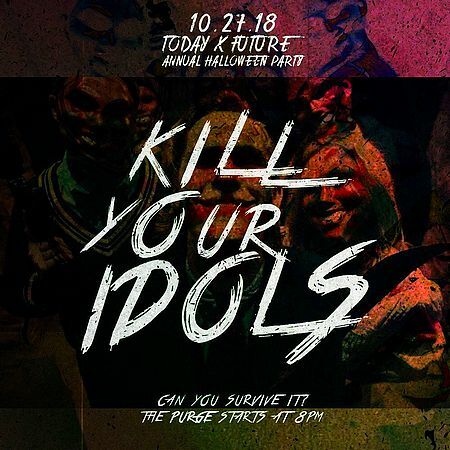 If you are, head over to the Today X Future: Kill Your Idols Halloween party! It starts on October 27, 8 p.m., and maybe you will be spared from the purge when you attend the party as your dead idol! For more information, log on to Today X Future’s Facebook page. Something from the outer space has just landed in Katipunan for the biggest night yet! 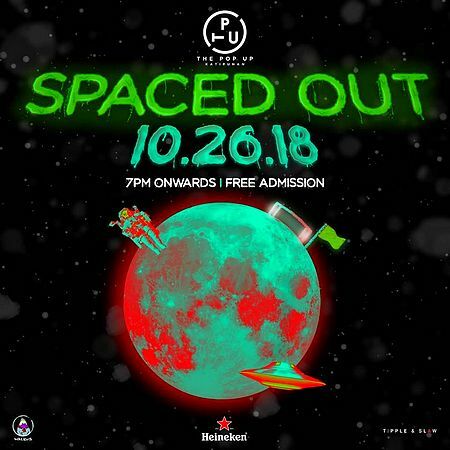 Get ready to take off in Spaced Out: The Pop Up Halloween Party, happening on October 26, 7 p.m. onwards. Admission is free. Prizes await those who come in their most out-of-this-world costume! For more information, log on to The Pop Up’s Facebook page. 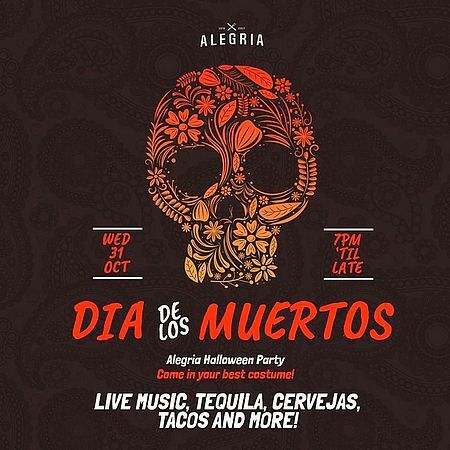 Drinks and entertainment await everyone in Alegria Cozinha Moderna & Sangria Bar’s Dia de los Muertos party on October 31, 7 p.m. There’s going to be music, tequila, cervejas, tacos, and a whole lot more! Round up the gang for this gathering of souls and wear your best costume for this fun night! For more information, log on to Alegria Cozinha Moderna & Sangria Bar’s Facebook page. 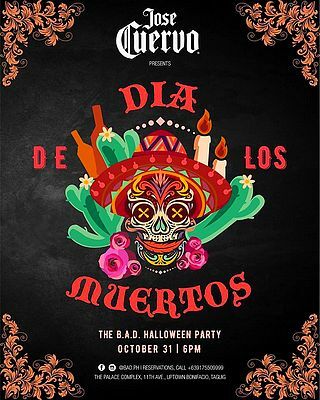 In case you’re still looking for a party to go to this Halloween, check out BAD Late Night Breakfast Bar’s B.A.D. Halloween Party on October 31, 6 p.m. It's a "no costume, no entry" party so better start planning who you’ll come as! If you plan to go bar-hopping on that night, you'll definitely want to hit this party, which is just one among the many options around the area. For more information, log on to BAD Late Night Breakfast Bar’s Facebook page. Time to get spooky! 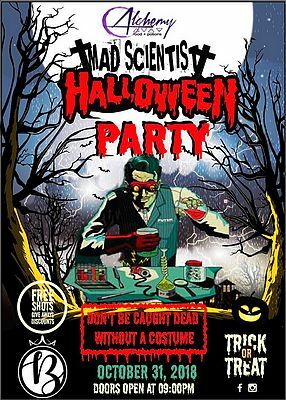 Over at Alchemy Bistro Bar, B. Fety presents Mad Scientist for Halloween, happening on October 31, 9 p.m.! It’s going to be night filled with creepy cocktails and potions that are sure to leave you hexed! DJs Rolf and Kris Gail have the beats covered, so all you have to do it show up in your freaky disguise! The best one gets a prize at the end of the party. Plus, free shots, giveaways, and discounts await everyone all throughout the night! Entrance is at P200. For more information, log on to Alchemy Bistro Bar’s Facebook page. Ayala Museum is cooking up something wicked for Halloween! Save the date for Dia de Muertos: Forgotten Souls, happening on October 26, 7 p.m. Restless souls are looking for peace and they need your help in going through rituals, superstitions, and challenges. It’s going to be an adventure filled with horror that you and friends just can’t miss! After the tour, the fun continues with crowd-favorite game Loteria with a twist! 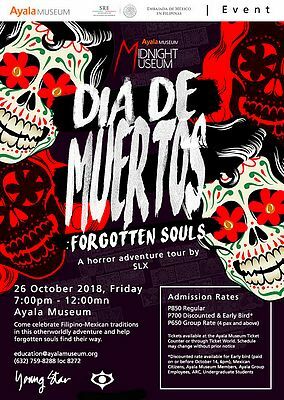 For P850, take part in the Forgotten Souls horror-adventure tour with Sipat Lawin and the Fil-Mexican Loteria Game Night, complete with access to the Ayala Museum galleries. Plan your Friday night and sign up for any of the following time slots: 7 p.m. to 8 p.m., 8 p.m. to 9 p.m., 9 p.m. to 10 p.m., or 10 p.m. to 11 p.m.
For more information, log on to Ayala Museum’s Facebook page. 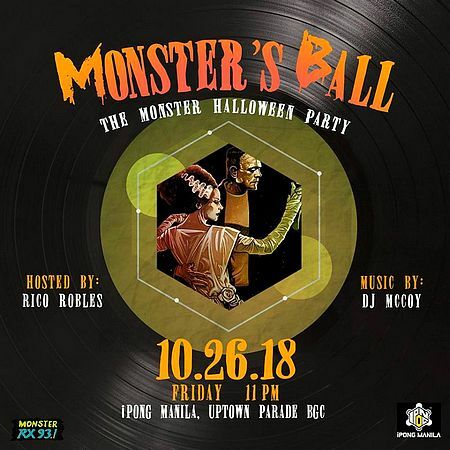 Make your Friday night the creepiest one yet with RX 93.1’s Monster Ball: The Monster Halloween Party on October 26, 11 p.m., at iPong Manila in Uptown Parade. Party with your favorite DJs and Monster Jocks as they, too, check out the first electronic beer pong bar in the country! Rico Robles serves as host, while DJ McCoy takes care of the music. For more information, log on to RX 93.1’s Facebook page. 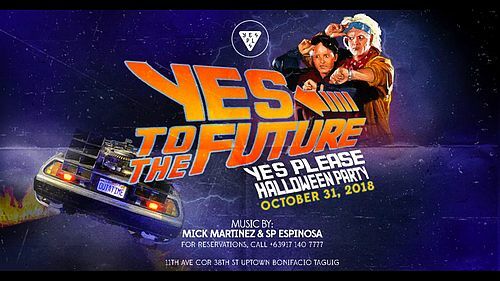 Say yes to Yes Please’s invitation to their Yes to the Future Halloween Party on October 31, 6 p.m. Let Mick Martinez and SP Espinosa take you fast forward in time with their sickest beats. Show off your best Halloween costume when doors open at 6 p.m.
For more information, log on to Yes Please’s Facebook page. Ready for Halloween? Buddha Bar is! 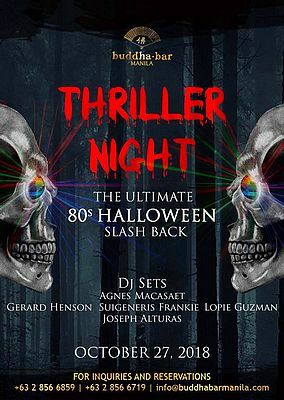 On the most wicked night of the year, travel back in time forThriller Night, the ultimate '80s Halloween Slash Back on October 27! 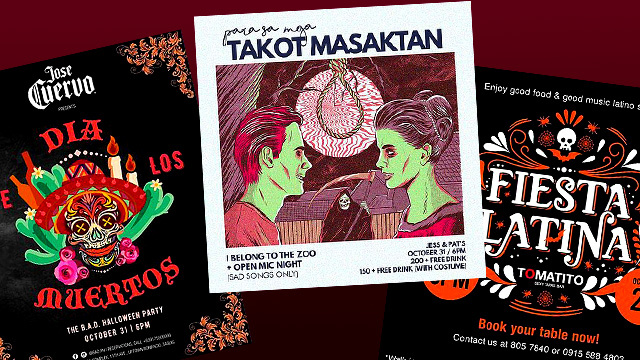 The best retro DJs will be joining the party, too—the likes of Agnes Macasaet, Gerard Henson, Suigeneris Frankie, Lopie Guzman, and Joseph Alturas—so you can dance the night away. Brush up on those moves and own the dancefloor this Halloween! For more information, log on to Buddha Bar’s Facebook page. Planning to take it slow this Halloween? 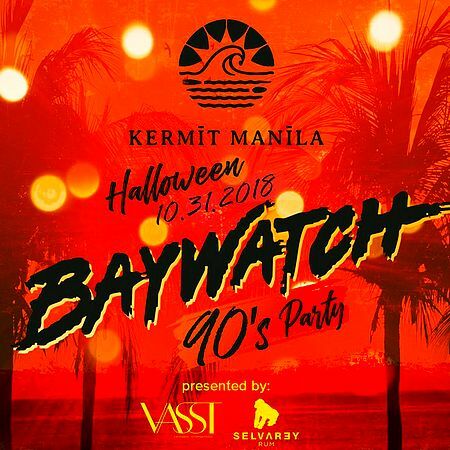 Kermit Manila’s Halloween party may just be the thing for you! Dress up in your favorite '90s ensemble and head over on the night of October 31 for the most fun throwback night. Time to bring out that red lifeguard suit and floater! For more information, log on to SelvaRey Rum’s Facebook page. Get ready to dance the Latina way! 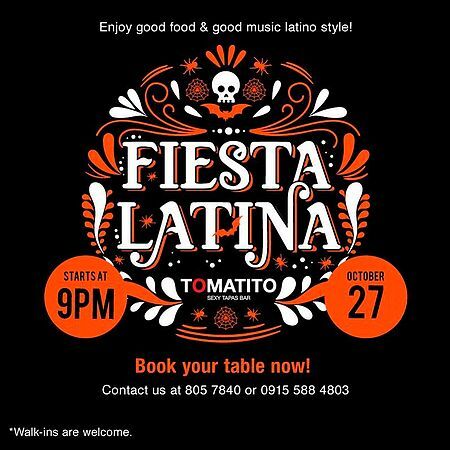 Celebrate Halloween with Tomatito Manila’s Fiesta Latina Halloween Party, happening on October 27, 9 p.m. Come for the food and drinks, and stay for samba lessons as Imperatriz Filipinense takes the dancefloor! With or without costume, you’re sure to have the best time over good food, upbeat music, and overflowing drinks! Entrance is free. For more information, log on to Tomatito Manila’s Facebook page. Get ready to scream at Acceler8’s Halloween Party on October 26, 7 p.m.! Fright Night Fridays come to a close with a party that will take your breath away as booze, music, and games fill the freakiest night of the year. Come in your best '80s-inspired costume and win awesome treats! Entrance is P100. For more information, log on to Acceler8’s Facebook page. 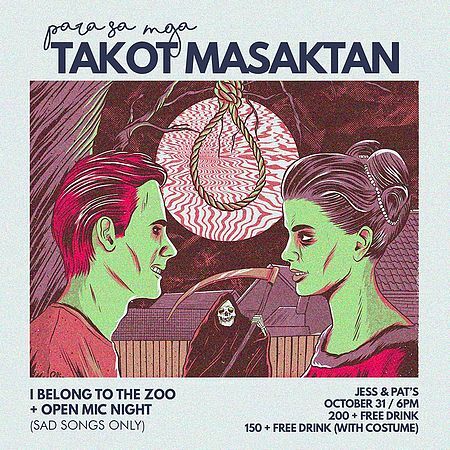 Whether you’re feeling scared or scared by your feelings, Jess X Pats’ Para Sa Mga Takot Masaktan Halloween Party might be perfect for you! Don’t miss a fun-filled night on October 31, 5 p.m., featuring I Belong to the Zoo, which will be followed by an open-mic night (only sad songs will be accepted!). Those who come in their costumes get to pay P150, while regular door charge is P200, inclusive of a drink. Get your feels ready! For more information, log on to Jess X Pats’ Facebook page.